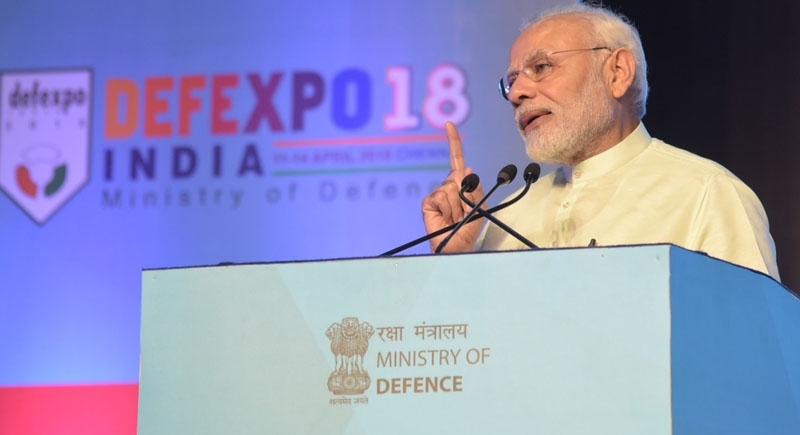 Chennai, April 12: Prime Minister Narendra Modi, speaking at the Defence Expo 2018 in Mahabalipuram, expressed his delight at the participation of more than 500 Indian firms along with over 150 foreign companies and delegates from about 40 countries. PM Modi said that the Centre's commitment towards peace is as strong as the one towards protecting its people and the nation. Inaugurating the DefExpo 2018 in Chennai, PM Modi said that the government’s commitment to peace was just as strong as its commitment to protecting the people and the country’s territory. For this, he said that the government was ready to take all necessary measures to equip the Armed Forces, including through the establishment of a strategically independent defence industrial complex. The prime Minister spoke how the government resolved the issue of providing bullet proof jackets to Indian soldiers was kept hanging for years. “You would have also seen that we have brought the process to a successful conclusion with a contract that will provide a boost to defence manufacturing in India”, he added. The PM said that the government had not only taken bold action to meet our immediate critical requirements, but also initiated a new process to procure 110 fighter aircrafts. Lauding the contribution of small and medium sector's contribution to defence production which has grown by 200% in the last 4 years, Prime Minister said government is committed to establish two defence industrial corridors, in Tamil Nadu and Uttar Pradesh. PM Modi said government has de-notified some items earlier made exclusively by Ordnance Factories, so that private sector, especially MSMEs can enter this space.